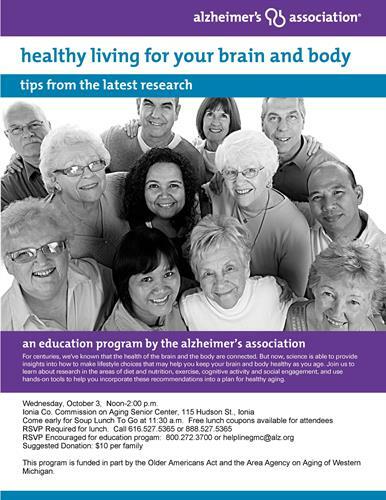 This education program by the Alzheimer's Association will be held Wednesday, October 3rd from Noon-2:00pm at the Ionia County Commission on Aging Senior Center, 115 Hudson Street, Ionia. Come early for Soup Lunch To Go at 11:30am. Free lunch coupons available for attendees. RSVP for lunch required, call (616) 527-365.